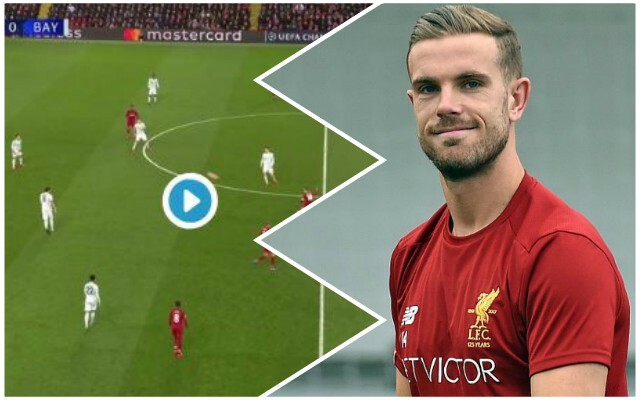 Jordan Henderson was exceptional in the centre of the Liverpool midfield against Bayern Munich this evening – bossing the match from start to finish. Against world-class opponents, he once again made some of his critics look incredibly daft. Thiago Alcantara and Javi Martinez are top class, but the captain stood up and was counted. Perhaps the highlight of his excellent night was this pass which almost saw Mo Salah score what would have been a simply sensational goal: it was Xabi Alonso-esque from the number 14. He doesn’t always reach the levels we saw tonight, but against top opposition, particularly at home, he always seems to excel. From now until the end of the season, starting at Old Trafford this weekend, it will be vital that he performs at that level again on a consistent basis. If we play that well on Sunday, the three points will surely be ours – and Henderson will be crucial in making sure that happens.